The Best Books Ever: A Murder of Magpies ~ Blog Tour review (by Jaime!) and Giveaway! A Murder of Magpies ~ Blog Tour review (by Jaime!) and Giveaway! 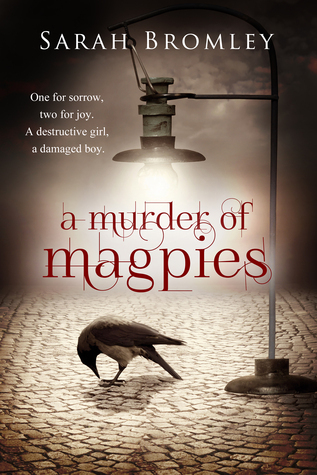 A Murder of Magpies is an intriguing, mysterious tale and it is one that I highly enjoyed. Even after finishing the story, I feel there are mysteries that still need to be unraveled. I loved the setting, the fantastically written characters and the incredibly unique story. Vayda, our MC and one of the two POV's and Jonah are brother and sister. Twins, to be exact, They each have their own individual "mind games" that they play, and these "games" must be hidden at all cost. Vayda is calm and quiet, always trying to stay in control of her game. Jonah is a wild one, quite the opposite of his sister. They balance each other out well. The twins and their father are always running, looking over their shoulders, and trying to stay below the radar because of something that happened with their mother, something that she died for. Ward is our other POV. He has had a troubled life, and at the beginning of the book, he is waiting to be seen in the office for getting involved in a fight started by Jonah. Ward was a great character, wonderfully written. He is guarded, and thus I still don't know enough about him, but I want to! I love these types of stories, that introduce mysteries from the get go. And a mystery it shall remain, until you read it for yourself. I will only say that this is a great read, full of mystery and suspense. It is all very dark and deliberate. You will not want to put this book down until the very last page, and when you absolutely must put it down, you will be thinking of nothing else but returning to it as soon as possible. I cannot wait to delve into the twins world again. One more thing that I absolutely have to mention? That cover. It is stunning. One of the best covers of the year, and it captures the essence of A Murder of Magpies wonderfully. Fantastic fonts, awesome tagline, and an air of mystery... My kind of cover!